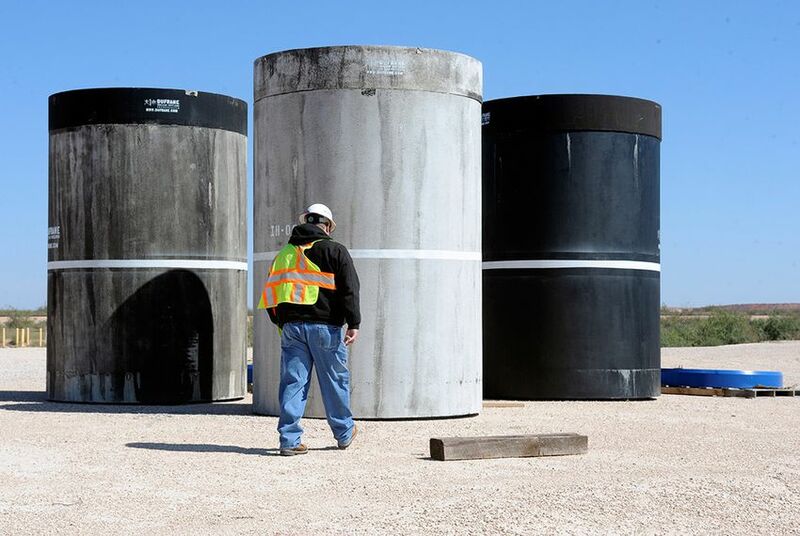 UPDATED: A state appeals court has thwarted the second of two challenges to a hazardous and low-level radioactive waste disposal site in West Texas in rulings that signal growing difficulties for those trying to scrutinize the decisions of Texas' environmental regulators. The Sierra Club on Friday lost its second of two challenges to a hazardous waste site in West Texas. This one concerned its permit to dispose of low-level radioactive waste. The Andrews County facility operated by Waste Control Specialists is the final resting place for hazardous waste and slightly radioactive items from shuttered nuclear reactors and hospitals, among other places. Texas' 3rd Court of Appeals — the same court that thwarted a similar Sierra Club challenge this month — said the Texas Commission on Environmental Quality was right to deny the group's request for a contested-case hearing on the low-level radioactive waste permit because none of the group's members were "affected" by the issue. The three-judge panel reversed a lower court's ruling. "Because TCEQ’s decision to deny Sierra Club’s hearing request is reasonably supported by the record, it was error for the district court to reverse that decision," wrote Justice Jeff Rose. A state appeals court has thwarted a challenge to a hazardous waste disposal site in West Texas – a ruling that signals growing difficulties for those trying to scrutinize the decisions of Texas environmental regulators. Depending on whom you ask, such a trend would either rightly save companies time and money or unjustly bar citizens from fully sharing their environmental concerns. The site, a 36-acre facility in Andrews County operated by Waste Control Specialists — a company formerly owned by the late Dallas billionaire Harold Simmons — is the final resting place for hazardous waste and slightly radioactive items from shuttered nuclear reactors and hospitals, among other places. Both the company and state regulators have repeatedly called the site safe. But environmental groups have closely scrutinized the site as it has expanded the scale of waste it accepts, raising concerns about the effects on groundwater and other resources. The Sierra Club has long argued that state regulators never gave the organization the chance to voice opposition to Waste Control Specialists' permits through a contested-case hearing — a drawn-out process resembling a trial in which companies and their critics present evidence and testimony in front of an administrative law judge in the hopes of swaying regulators’ opinions. Earlier this month, Texas' 3rd Court of Appeals upheld a lower court's ruling that the Texas Commission on Environmental Quality properly denied the group a hearing because none of its members met the threshold of being an “affected person." At issue in that Sierra Club case was one of several permits the TCEQ has granted Waste Control Specialists. The permit enabled the company to dispose of high-purity uranium metal that originated at a long-closed U.S. Department of Energy Facility that is now a “Superfund” site. The Sierra Club said that the waste site could negatively affect two of the group's members who lived just across the border in Eunice, N.M., putting their air and water quality at risk. That included Rose Gardner, who operates a feed store just four miles from the waste site. In making that determination, the court cited two Texas Supreme Court decisions handed down last year — TCEQ v. City of Waco and TCEQ v. Bosque River Coalition. Both involved challenges to feedlots’ wastewater discharge permits. Cyrus Reed, conservation director for the Lone Star Chapter of the Sierra Club, said he worried the appellate court's recent ruling would have implications that extend beyond Andrews County, giving regulators more wiggle room to deny hearings they might consider burdensome. Texas is one of just a few states that allow the public to request contested-case hearings, said Jeff Civins, an Austin-based attorney who has represented companies in such hearings. In most states, citizens are invited only to submit comments to regulators ahead of a vote. Civins said it makes sense that regulators determine who should get a hearing, because they are the ones ultimately ruling on the permits and because the process eats up a lot of resources. The process can take up to a year and cost up to $1 million a project, he said. Jim Bradbury, an environmental lawyer who has represented clients on both sides of such disputes, said the Sierra Club ruling confirms the TCEQ’s discretion to determine who gets a hearing, but doesn’t fully erode the process. Parties who live adjacent to or directly downstream from companies seeking environmental permits will likely still draw hearings, he said. Over the years, the hearing process has been a useful tool for concerned stakeholders, Bradbury said, but it has also been abused by groups trying to advance policy or business goals by slowing down the permitting process. Citing such criticism, some state lawmakers have pitched legislation trying to change the system. Last session, for instance, state Sen. Troy Fraser, R-Horseshoe Bay, wrote a bill that would have ditched the contested hearing process. That legislation failed, but Bradbury and others expect it to crop up again next session. Meanwhile, the Sierra Club has another challenge to Waste Control Specialists pending in the same appeals court. That one concerns a license for disposal of low-level radioactive waste. This article and headline has been updated to clarify the differences between two Sierra Club challenges to permits issued to Waste Control Specialists.